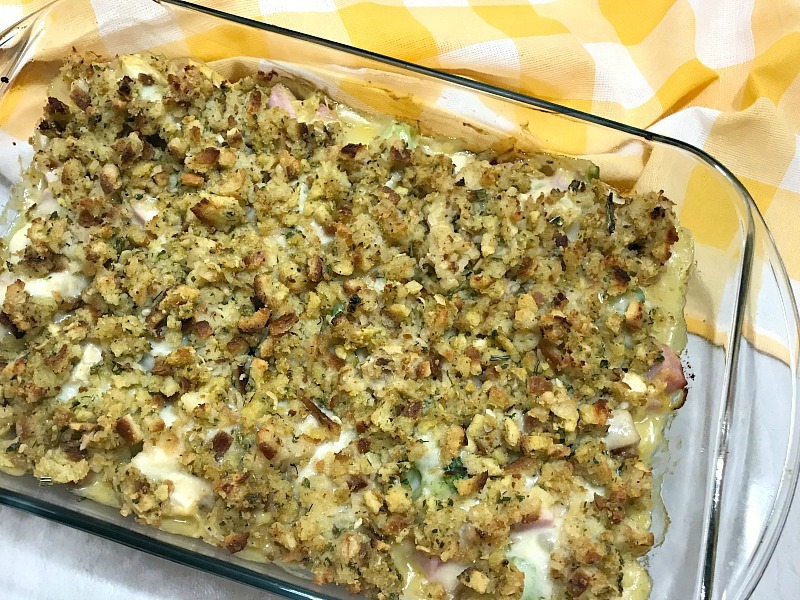 This Chicken Cordon Bleu Casserole is simple to make and has all the flavors you love about the classic dish. It’s a tasty dinner for any night of the week. Do you love casseroles as much as I do? I don’t know who invented the very first casserole, but they should be applauded. I love meals that you can combine flavors, foods, and get a hearty meal. I’m a bit one-pan recipe gal, but not all casseroles fit that bill. Sometimes you have to dirty a few dishes to get the casserole made. When hubby and I were first married, we didn’t have a lot of money so our meals were pretty basic and there’s nothing wrong with that at all. We made do, and now we reminisce about the “good ole days” and how we used to live off of boxed mac and cheese, frozen pizza, and anything with chicken. We would buy these frozen Chicken Cordon Bleu “hot pockets” of sorts when they were on sale and we loved eating those for dinner with that boxed mac and cheese. The chicken breast was breaded, stuffed with ham and Swiss cheese. Delicious! 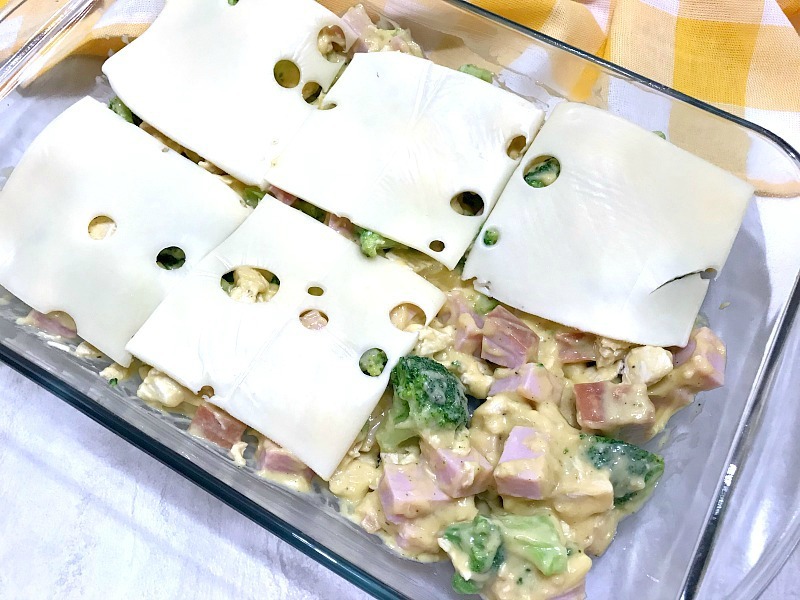 My niece reminded me of those meals with this casserole that she loves. I knew I had to make it for dinner and it was a perfect recipe for #OurFamilyTable’s event – Comforting Casseroles hosted by Christie from A Kitchen Hoor’s Adventures, and Heather from Hezzie-D’s Books and Cooks. Look for the recipes from this event at the end of this post. If you’re short on time: use rotisserie chicken or leftover chicken. You can boil chicken breasts (or thighs), grill them or saute them. Make it easy. For the ham: I used a ham steak and diced it up, you can also use deli ham. Ask the person behind the deli counter to slice a thick piece of ham (whatever kind you like) at least an inch thick. Leftover ham from a bone-in ham is great for this meal. Save some from your Easter ham! If you’re looking to cut back on the sodium: use low sodium stuffing mix, low sodium cream of chicken soup, and adjust the added salt in the recipe to your tastes. Also, watch the sodium in some hams. I used low sodium cream of chicken soup, no additional salt, a lower sodium ham steak. When I make it again, I will be using the low sodium stuffing, too. 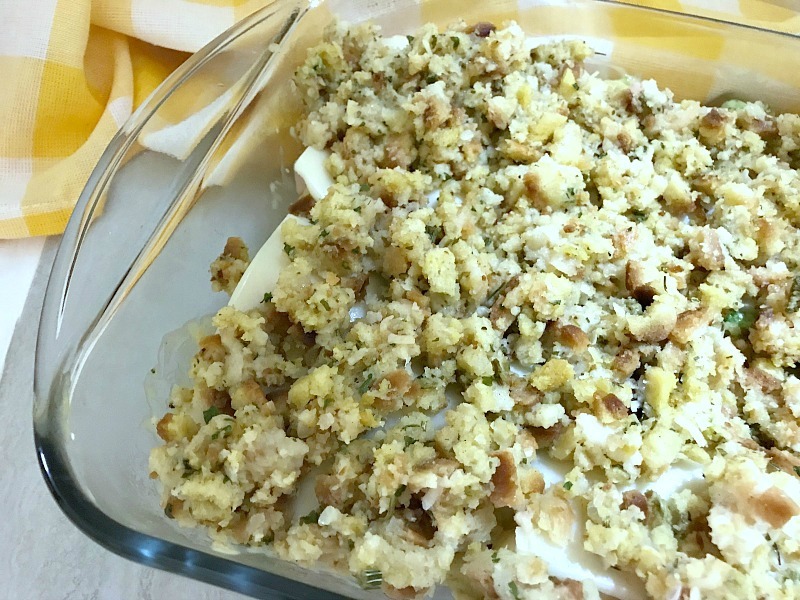 If you make your own stuffing from scratch, this is a great way to use some of the leftover stuffing. Great way to use up leftover turkey as well from Thanksgiving. You can use either fresh or frozen (do not thaw) broccoli. If you’re using fresh, cut the pieces into small florets so it will cook evenly in the oven. 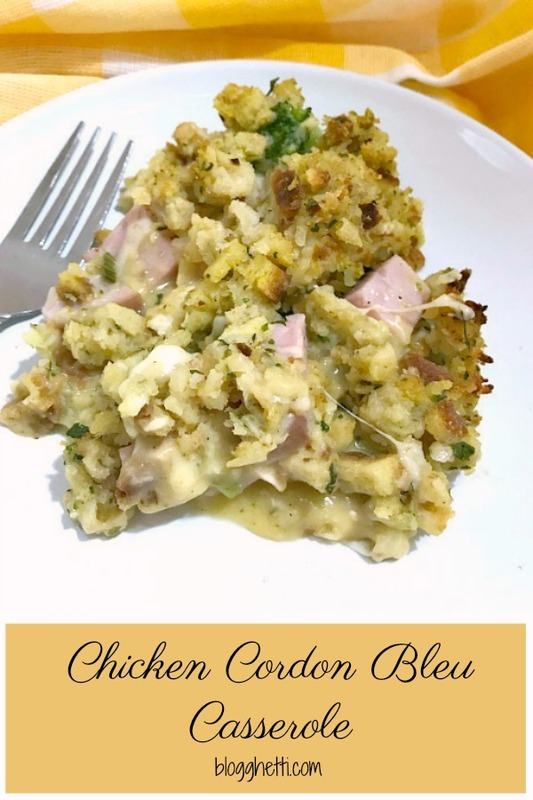 This Chicken Cordon Bleu Casserole is simple to make and has all the flavors you love about the classic dish. It's a tasty dinner for any night of the week. Preheat oven to 375 degrees and spray a 2 quart casserole dish with nonstick spray. Prepare stuffing as directed on package, and set aside. In a large bowl mix soup and mustard together. Add in the diced chicken, ham, broccoli, and combine. Season with salt and pepper, to taste. Pour into prepared casserole dish and top with the stuffing. Bake 35 to 40 minutes or until heated through, and stuffing is golden brown. I used to make something very similar to this when we were young and poor! Great “throw back” recipe. It sounds amazing. This looks so good! And perfectly budget friendly, too. I love those types of meals. Definitely chicken cordon bleu is a classic! I like the way you simplified this. I love casseroles like this where you’re inspired by standard dishes! Delish! I’m a big fan of cordon bleu – I love this weeknight-friendly take! Such a great idea to make this into a casserole! Yum! What a great casserole! Chicken cordon bleu is such a great dish, and this is such a good way to simplify it!